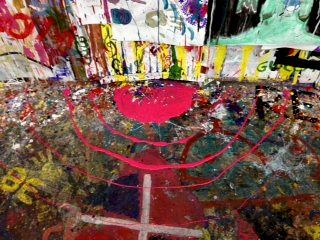 We have a backlog of wonderful art and creativity to share with you. And to all the moms who receive this newsletter, we send you our best early wishes for a wonderful Mother's Day. 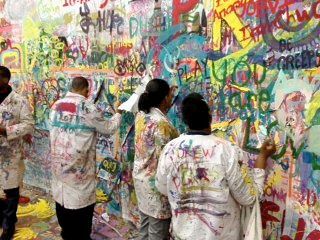 At the New Museum in New York City, I took my students to see the Pawet Althamer show. Having taught them the Zentangle Method for months, they were able to appreciate and take part in an activity which was new to them. Thank you so much for the speedy and friendly reply. I wish your business every success in the future. My girlfriend has such boundless creativity and in the last year she has branched out so much in many ways but especially her artistic expression. 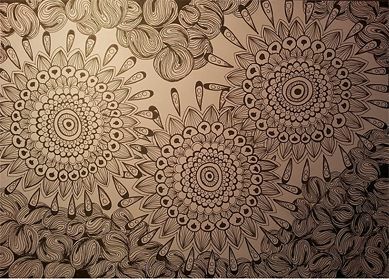 When she discovered Zentangle it stepped up another notch. Your incremental system is genius and instills in its users the belief and knowledge that they can create beautiful art. I congratulate you on an exceptional product, a conscientious business and the courtesy which you show to your customers. I am the Life Enrichment Director at an assisted living facility and we have started to learn how to Zentangle with certified instructor Christy Hester. We have partnered with the Arts Council and the Nuveen center to bring cultural programs to the residents in our community. We have had two programs so far and have Zentangle as a monthly activity on the 3rd Saturday of each month. It has grown quickly in popularity and our residents have begun to invite their friends and family members to join in the fun. We are hoping to turn it into quite a program, anticipating more friends in the greater community to join. 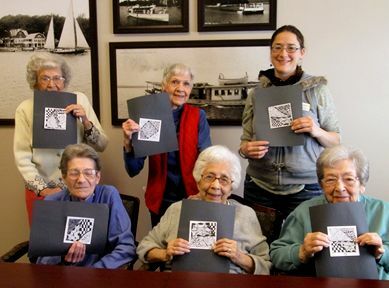 I have enclosed a picture of our seniors (mostly in their 80's and 90's) so you can see how proud and pleased they are with their final work of art. 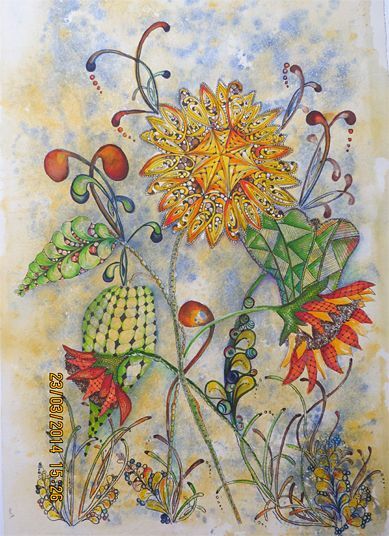 We feel very blessed that Zentangle came into our lives. Whenever my granddaughters come to visit I let them read your news letters and then I do zentangles with them. Yesterday I received an e-mail from my granddaughter. She was so excited to tell me that her school teacher in art class is teaching the Zentangle Method and she had told her teacher . . . "Hey! My grandmommie taught me Zentangle!" So you see the ripples you are sending magically around the world! What a blessing to send such happiness. Thank you so much. I have just been introduced to the mindfulness technique in therapy sessions for anxiety-panic disorder. Yes, to continued use of your method, it has helped me so much to calm down if in a panic situation. Hope you are both well. Hoping Spring will be on its way soon for you all. I wanted to write and say thank you for providing structure and mediation to something a lot of us have been doing naturally all our lives. My mother was a born doodler. And she passed that passion for pens on to me, her only daughter. However I have never had any drawing skills so my doodles adventures were restricted to back of napkins during phone calls or business meetings. But a lot of things have changed recently. My mother passed away at the end of last year and I was diagnosed with leukemia. I'm going to be fine with treatment but have already spent more time in the hospital than I ever would have liked. I was just discharged this afternoon after a six day stay-cation in my local hospital. It isn't always easy to read or concentrate with the pain and noise distractions, but I was prepared this time. I packed up some pens, my tile sketch book, and bookmarked your site on my smartphone. Whenever I needed to "get - away" I pulled out my supplies and tangled in my hospital bed. It hasn't been an easy week, but it could have been a harder week. Yesterday when my husband came to visit I found myself pulling out my sketchbook with pride to show him my work. I never would have achieved that sense of success without your art program. I just wanted to say thank you from the bottom of my heart for your act of kindness. 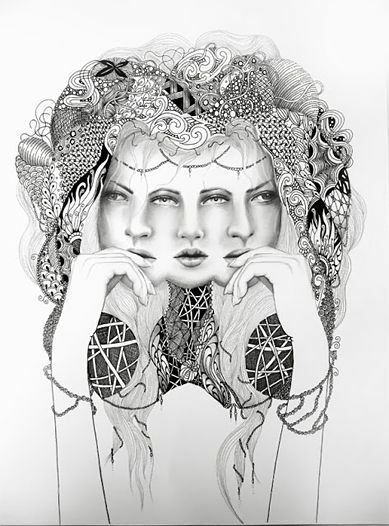 Thank you sooooooo much for the gift of Zentangle, that you and Maria have brought to the WORLD!!! The world is becoming a more beautiful place, 'One stroke at a time, too"! Thank you so much!!! 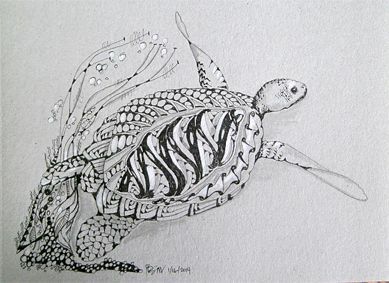 Hy maria and rick Came into contact about two weeks ago with Zentangle and are practicing almost every Evening since. I have never been able to draw properly, and now there are such wonderful Patterns that you can just learn by practising and following recomendations. Waauw, a new world opening. 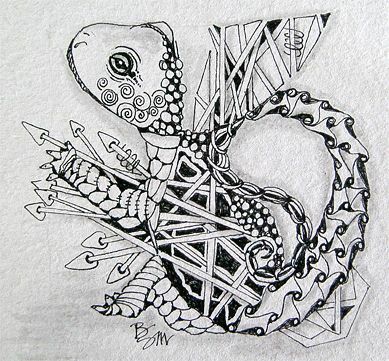 Recommended Zentangle to a friend in Holland whose 13 year old daughter likes to draw She made some zentangle drawings already and will use them to get into a special line in a new school, isn't that something. Thanks for helping us develop new skills, Look forward to my first newsletter. I followed your blog since almost two years and I love it. I am an Egyptian humanitarian worker, currently in South Libya, and I found a great energy to pass stormy days doing some of your tangles. Here is one I finished this week that I like to share with you. Keep it up. Thanks for sharing your knowledge and art. Firstly, thanks! I have been swept away with Zentangle, and have created nearly 1 "tangle" a day since last October. I love technical wildlife drawing, and after understanding more of the Zentangle technique, the tangles have begun invading my wildlife art. I've attached a few samples . . . hope you enjoy. I love your newsletters! Such creativity out there. After reading Donna's article about Parkinson's I felt the need to write about my experiences as well. I am a part of the Facebook community battling this mysterious syndrome and supporting others through experiences. 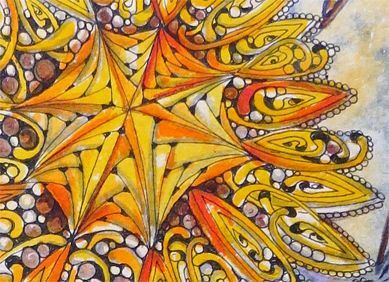 Many times I have mentioned how much Zentangle helps me with my chronic pain. Obviously, it doesn't take the pain away, it "distracts" me from the constant, dull, aching parts long enough to give me a bit of reprieve. It is meditative to me, I have literally lost hours of a day that started badly. I then have something beautiful and gratifying, helping me not feel so lost. It lifts my spirits so much and this is truly a huge help in the fight. I have required less medication when tangling and that is a definite plus! I believe Zentangle has a place in the treatment of fibromyalgia and arthritis, like knitting, motion is lotion. Thank you so much for bringing Zentangle to us!!! I've always enjoyed patterns and have done Kaleidometric and Polysymmetric art forms for years. I am finding that tangling suits me too. 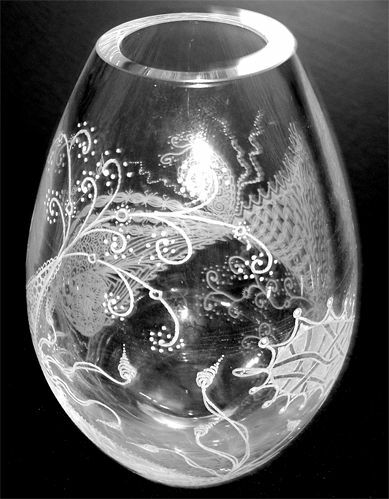 I'm a professional glass engraver so thought I'd experiment with a bit of tangling on glass. Hope you like it. I call it "What a tangle!" We all know as CZTs how we influence our students, but I don't think we realize how many other people we may touch without even knowing. I received a letter a few days ago from a young man in Argentina, writing for his mother who doesn't speak English. He said she has been following my blog, Katydid's Tangled World, since finding out about Zentangle on the internet. as his mother was very interested in taking a class (I referred him to Mary Ann Scheblein-Dawson). "You have inspired a lady living 5000 miles away!". His email made my day! I'm still smiling! That's the title to our most recent blog entry. Check it out. It has some fun images, a great sentiment and a surprising story. Thank you so much for sending us such wonderful stories and beautiful creations! We have only scratched the surface in sharing these and we'll do more soon. And once again, even though every is Mother's Day (and Father's Day, and Thanksgiving Day), our warm wishes to all moms and your families on this coming Mother's Day.